Red Bud Isle has undergone volunteer-driven renovations. Two Austin groups are in a dispute over how to keep Red Bud Isle from going to the dogs. 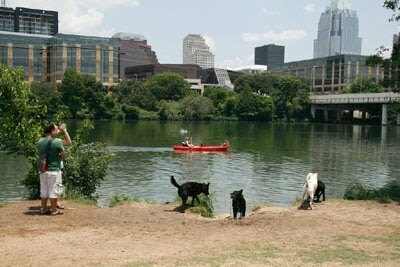 The 13-acre, leash-free dog park off Red Bud Trail below Lake Austin's Tom Miller Dam has been undergoing a series of repair and improvement projects for two years, thanks to the Friends of Red Bud Isle, a volunteer organization that is working to combat erosion and invasive plants. But Monday, another group that includes many dog owners accused the organization of violating city codes, approving projects in secret and possibly damaging the park's ecosystem. "The projects they were working on were good at the beginning, but larger projects have been flawed," said Phil Burns, who led a public meeting Monday in West Austin to voice concerns about the direction the park is taking. "One group is running the show, and that's a problem." Burns — and several others at the meeting, which included about a dozen fans of the park — takes issue with what it calls the aggressive clearing of underbrush in the past two years. He said the clearing has taken away from the park's "primitive" look and made it tough for any plants to grow. He said crews have come into the park and cleared away trees without the city's approval or the public's consent.